When we lived in Sa Kaeo 2010 a trip to the Big C (not very big at all compared to city ones) in SK town was seen as a sort of civilised outing, 92km round-trip from where we lived. Big C Supercenter A Big C Supercenter is a hypermarket targeting mid-to-low income customers offering value through combination of low prices, wide selection, clean and efficient shopping environment, and good service. 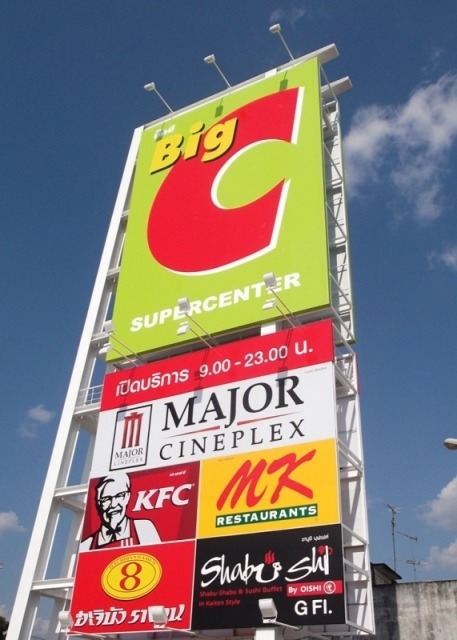 There are 105 Big C Supercenters in Thailand as of 2016. 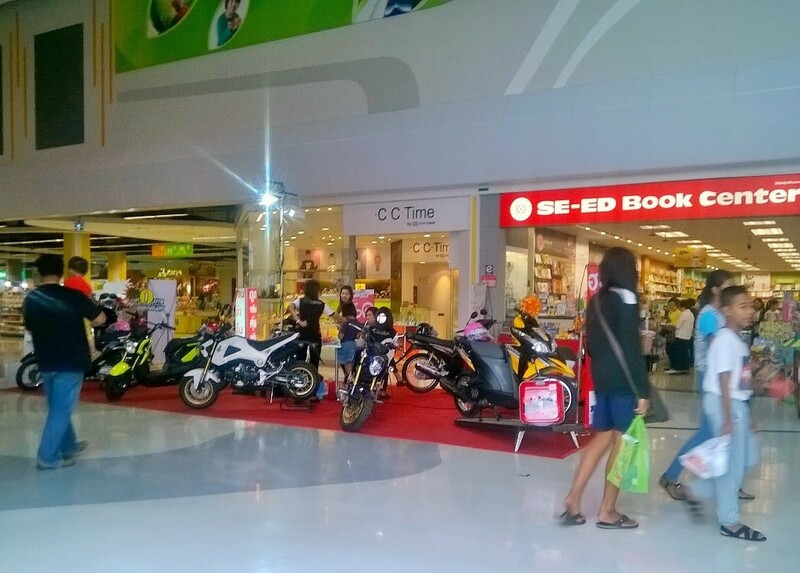 Big C Market is supermarket format, targeting mid- to low-income customer. The smaller size of a Big C Market enables penetration in areas outside the main district of a province. It is designed to be the largest modern retailer in its service area. The stores differ from traditional supermarkets that concentrate mainly on food by offering a range of products from fresh food to electronics. 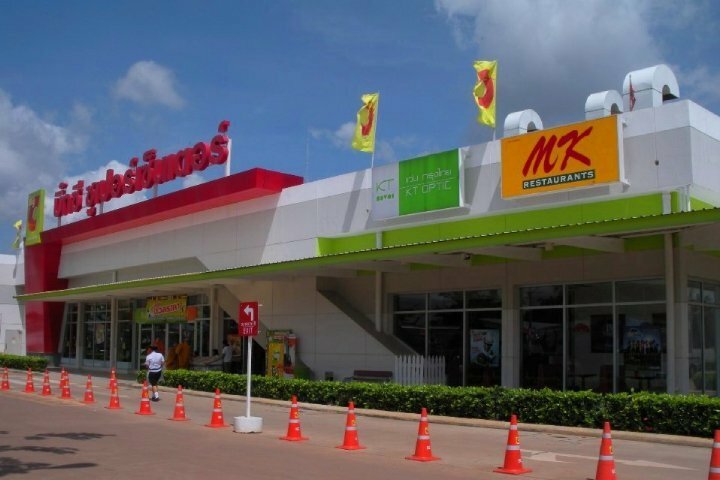 As of 2016, there are 31 Big C Markets scattered around Thailand. Pure by Big C drugstore format offering pharmaceutical, health, beauty, and wellness products. Most of Pure drugs,Promotion, Blond Kid, ores are in Big C hypermarkets and Big C Markets. There are 134 Pure outlets in Thailand (2016). Makro is our go to food supermarket though it's not a department store per se. Our BigC mall holds all the banks and franchise restaurants though KFC is the stand-out best and well patronised. Number 8/Ichiban is consistently good whilst Black Canyon is absolutely terrible. In the north we're spoilt for choice of imported and local goods plus fresh produce though lacking in quality (ocean) seafood. TescoLotus malls compete with BigC head to head and TL food-courts are superior in our opinion. Always felt at home in a Big C i guess because it's western style and not your boonie type Thai market...although i can cop them too. MK was,and still is,my go to restaurant in LOS. Last edited by Hatari; 26th August 2018 at 18:27. Extra, Hypermarket, Department Store, Talad, and Express. Extra, Hypermarket, and Department store formats have an extensive fresh food, prepared foods, and grocery offerings as well as a non-food offerings including electrical appliances, apparel, toys, stationery, and household goods. Talad is a "supermarket format" selling mainly groceries. Express is a convenience "mini-supermarket" format. Many of the products on the shelf are Tesco house brand products. The bigger stores are often set in malls and have food courts and many other shops and stalls available as well as large car parks. Temperatures are kept at a relatively cool 26C. Most recently, in April 2013, Tesco Lotus introduced online shopping. As of early-2018, Tesco Lotus's total retail floor space stood at 1.4 million m2. In August it opened store number 2,000 in Thailand. Last edited by Hatari; 26th August 2018 at 17:18. NONTHABURI, 23rd August 2018 (NNT) – Hypermarket chain Tesco Lotus has launched its latest store in Bang Bua Thong district of Nonthaburi, offering customers self-service checkout technology in order to keep up with the 4.0 era. 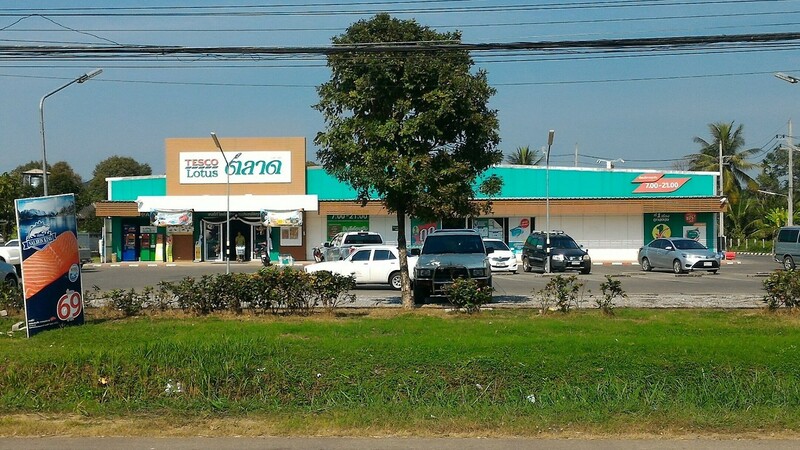 The Bang Kruai-Sai Noi Branch is the newest and the 2,000th branch of Tesco Lotus. Intended to serve as the model for “4.0 Stores”, it is equipped with the “Scan as You Shop” technology from England which provides shoppers with more speed and convenience. With the self-checkout feature, customers can scan items they want to purchase and put them in bags by themselves. Moreover, they can choose to pay with a QR code in line with the cashless society concept. This branch also has a Green Lane to serve customers who don't wish to receive plastic bags, free Wi-Fi available throughout the premises and a recycling machine, in which customers can deposit recyclable items in exchange for points. Mr Boonyarit Kalayanamit, Director-General of the Department of Internal Trade, pointed out that Tesco Lotus plays an important role in distributing income to rural areas as the company buys produce directly from agriculturists. The new Bang Kruai-Sai Noi Branch also allocates a space at no cost for the sale of community products. TESCO Lotus opened its 2,000th branch in adjacent Nonthaburi province today (August 23, 2018) after developing the large hypermarket as “store 4.0” with the introduction of Scan As You Shop technology from UK, Thai News Agency reported. According to Tesco.com, Scan As You Shop is a quick and simple way for Clubcard members to shop. You scan your shopping as you go, then pack it straight into your bags. Your scanner will even track your spend as you shop. When you’re done, there’s no need to unpack it. Just go to the Scan As You Shop payment area, scan the barcode at the top of the till, pay and off you go. Last edited by Hatari; 26th August 2018 at 17:23. 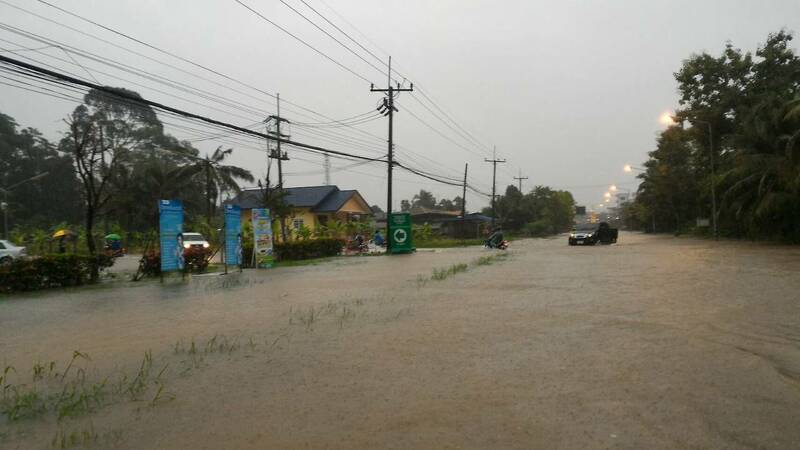 I usually do most of my regular shopping at Lotus Tesco in Chiang Mai, but only because Big C is a little further away. The Airport Plaza is over priced by comparison to the central city markets. I've always found Robinsons over priced in any Thai city I've visited. I can buy cheaper in Canada. But, as I keep saying, you really have to know your prices on EVERYTHING... from food to clothing. It can really vary. Because I spend half my time in Canada and half my time in Thailand I get a chance to comparison shop and understand what are good deals and what aren't. I've always found that good quality running shoes are cheaper in Canada than in Thailand... but the shirts I like I can only find in Thailand. ^ Tops was good for bread and cheese in CM but everything else food wise was usually Rimping. Rimping supermarkets are great though I feel they may be struggling following recent expansion. Surprising VillaMart isn't on KS. Rimping is closer to my hotel than Tesco Lotus, but I've found their prices higher for everything. However, they do carry imported items not found in other stores. So, if you have your heart set on some food item that you can't find anywhere else, then Rimping is the market for you. All their stuff is high quality.